The Haitian government is continuing its push to turn Ile à Vache (Cow Island), off Haiti’s southern coast, into a major tourist development. The island’s 15,000 residents, however, are resisting the move, saying they were not consulted, are not included, and are being uprooted. This week, Haïti Liberté conducted an interview with Kénold Alexis, a leading member of the Organization of Ile à Vache Peasants (Konbit Peyizan Ilavach or KOPI). He explains why and how the people of Ile à Vache, under KOPI’s leadership, are resisting the Haitian government’s tourist development on the island, and how heavily-armed police are terrorizing and Haitian government officials mistreating the island’s residents. Haïti Liberté: Earlier this month, Haiti’s Tourism Minister Stephanie Balmir Villedrouin said that the Haitian government has not and would not expropriate peasants on Ile à Vache and that those affected would be compensated for any losses. What is your response? Kénold Alexis: I have to say that the minister is lying. Since the beginning of the project, the Tourism Minister has been lying to us. The project landed on Ile à Vache with the minister. We had only heard talk of the project. They never came beforehand to sit down with the island’s people to tell us what the project entails. It was when they began to intrude on the peasants’ lands with surveyors and tractors, bulldozing the peasants’ coconut trees, mango trees, and all the fruits they had planted on the island, that was when the peasants began to put their foot down, to demonstrate, to demand explanations about the project. But they never came to sit down with the island’s people to listen to them or to tell them how the project would be undertaken. HL: So when the government now says that nothing will be done arbitrarily, you don’t buy that? KA: No, they have been lying to us from the start. Look how this started. They published a decree in the official journal Le Moniteur of May 10, 2013 where they declared Ile à Vache a “zone reserved for touristic development.” They declared the whole island “for public utility.” The peasants were automatically dispossessed by this decree. HL: What currently is the police presence on the island? KOPI called on the government to withdraw the Haitian National Police’s Motorized Intervention Brigade (BIM) from the island. Has there been any sign that they will comply? KA: After our big Dec. 27, 2013 demonstration with which we demanded an explanation about the project, the Tourism Minister came to sit down with us empty-handed, trying to give us a verbal explanation of the project. We in KOPI asked her to go find the documentation for the project and bring it to us. A huge project like this cannot be presented to us without our reviewing the relevant paperwork. She left and made a second trip to us bringing the documentation. We asked her to give us about two months for us to read and analyze the documents to see what was good in the project. At that point they said we would have a truce, and all the activity on the island would be stopped. They would not do anything until we called them to tell them how we see the project. Well, they violated that agreement and our rights. They came and started work on an airport. They began digging in [the township of] Madame Bernard without respecting us. We therefore had to make a third demonstration on Feb. 7, 2014. After that demonstration, the government’s local interim agent, Fritz César – who wasn’t even in Haiti, he was in the United States – came and learned that we had organized a demonstration on Feb. 7. He went on the radio an said that we entered, carried out reprisals, and burned things at two hotels [Port Morgan and Abaka Bay Resort] which are in an area called Kay Kòk. But there was never anything like that. Our demonstration was peaceful, without violence. But on Feb. 8, the government deployed more than 100 BIM agents with assault weapons. Since then, many young men who were in the movement have gone into hiding. They spend their days in the streets, and when the sun goes down, they go home. Up until today as I speak to you, BIM agents are sowing terror day and night, creating great anxiety and fear in the population. They beat people, mistreat people. There are some women who were pregnant, but due to the emotion caused by the BIM, they have begun to bleed, and the bleeding hasn’t stopped. For some other residents, they hear a loud noise and they pee on themselves because they are constantly scared, never having seen men with such big guns. HL: What is the situation of Jean Maltunès Lamy, who was arrested on Feb. 21? 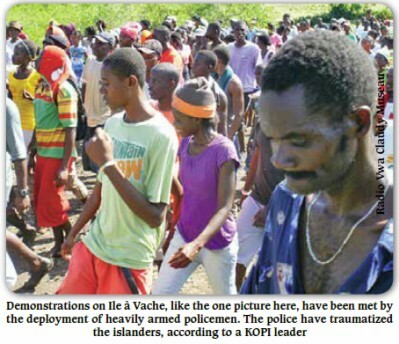 Have the authorities responded at all to the demand of Ile à Vache residents that he be freed? KA: Jean Maltunès Lamy is a policeman, but he is also the vice-president of the Organization of Ile à Vache Peasants [KOPI]. He was stationed in Port-au-Prince, and they arrested him there most likely due to his position against this project. As soon as they arrested our comrade Maltunès, the people again took to the streets to demand his liberation, the rescinding of the decree dispossessing peasants of their land, and the withdrawal of the BIM agents from the island, because they have done many wrongs to the peasants here. HL: Mr. Maltunès Lamy is still being held in the National Penitentiary. Have you any news of how he is doing there, of how he is holding up? KA: Yes, we get some news of him from his wife who goes to see him in the prison. But we in KOPI have no direct contact with him, and of course in prison he has no phone. But his wife gives us information about him. He is in a bad state, not well at all. Yesterday we had a meeting with an organization which says it is acting as an intermediary between the government and us in KOPI and the peasants on the island. Well, Maltunès’ wife came to that meeting and it was with tears in her eyes that she told of the bad state he is in. He has children. His father just had an operation and is due to have a second one. Maltunès should be taking care of those things, but instead he is in prison. HL: What is the next mobilization foreseen on the island? KA: Presently, we are standing our ground. The people are mobilized. We say that if this project is going to take place on the island, the government will have to kill us all because we are all completely opposed to this project. If this were a development project, we are not opposed to development. We know that development is done with and for people in the community. But this project involves hotel chains, agricultural firms, golf courses. We have 12 beaches on this island. They took ALL of them, not leaving even one so that residents could take a little dip in the ocean. In a development project, there is the economic aspect and the social aspect. In this project, which we see they have bundled it up to put on the head of Ile à Vache’s people, we see the economic, but we don’t see the social, because we don’t have running water, electricity, roads, or even latrines. Three-quarters of our people have to do their business on the ground. We don’t have professional schools. We don’t have anything at all. All we have is a national public school right next to where they are making the airport. They say they are making an international airport. There is a national school right next to it where the students are sitting on rocks as the take their classes. And the international airport we hear they are making is on the eastern end of the island, where there was a natural forest where the peasants used to harvest honey. There was a crab the peasants used to harvest there, above all in the months of May and June. The peasants used to make thousands of dollars from that forest. But now, they have completely destroyed that forest which renders the population of the zone of Baleraz on Ile à Vache completely vulnerable. During hurricanes, it was the forest which protected the residents of Baleraz against the wind and rain. HL: What kind of solidarity have you received from other Haitians? KA: We have received solidarity from human rights organizations coming from Port-au-Prince. After Jan. 8, the BIM agents beat up many people with clubs, broke people’s heads, had them rolling on the ground, stuck guns in their ears, and kicked them. Many people were traumatized. Human rights groups like RNDDH [the National Network for Human Rights Defense] came to question people, as did radios like Radio Kiskeya and Radio Vwa Claudy Museau from Aux Cayes. There was a meeting between the minister with the population. They didn’t want journalists to come. It was just their journalists that they wanted to be there. After they came out of that meeting, even though there was no agreement, no results with us, they said they had reached a deal with us, everything was going well on the island, even though nothing was going well at all! They were coming to impose a development on us by force. We know that development is done with people and for people in the community, but it is with guns that they are forcing development down our throats. This minister who says that everything is going well, in the first meeting, she said that they were going to displace people and put them in three places: Kay Kòk, Madame Bernard and Point Claire. They said in those three places they would provisionally put people for six months. We are determined on Ile à Vache, we are not going to be displaced. We are not going anywhere, because we were born here, we live here, and this is where our umbilical cords are buried. It is true that they came to take this island from us and put us in some other place. And if you ever see Ile à Vache, you’ll see that it is a virgin island. Whatever tourist comes to Ile à Vache, they always say that Ile à Vache is another country, Ile à Vache is not in Haiti, because you can walk wherever you want, there is no crime. It is with the deployment of the BIM agents that insecurity has come to the island. Previously, people slept where they wanted. I have a nice house where I am with a beautiful lawn. When it’s hot, I don’t sleep in the house. I just take a rug, a sheet, or a reed mat (nat) and put it on the ground, and then we sleep until the next morning. We don’t have any insecurity. But the BIM agents have brought insecurity. The population has become fearful and traumatized. There are old folks who have become uncontrollable, they can’t talk. There are even people who have become sick and are lying on hospital beds ready to die because of the BIM agents’ pressure on the island. HL: When journalists from Haïti Liberté visited last week, they couldn’t find a boat. They were told that the government had paid boat captains 10,000 gourdes ($225) to not take people to the island. What was that all about? KA: There was a delegation of journalists and human rights people who were coming to the island. The authorities knew the day the delegation was coming and managed to find a way to prevent boats from coming to the island that day. They counted well, but calculated poorly because we in KOPI have our own boat. We went and got those people so they could come and question peasants who have been victims of the BIM. We take this occasion to let people know, nationally and internationally, that we on Ile à Vache are threatened. People sleep with one eye open. You might go to sleep in your house and wake up to find a BIM agent in your yard with an assault weapon, asking your name and if you are a member of KOPI to arrest you. They are trying to stop this island’s resistance.